System has moved inland, comparitevly fast. and at the time lies 12.8N and 78.5E, West of Arcot, near the Karnataka border. Its centre is now 120 kms East from Bangalore. Strength at 989 mb and core winds down to 45 knts now..soon to become a Deep Depression. Cyclone Nilam made Landfall between Puducherry and Chennai, in Southern Kanchipuram District around 6.30pm IST Wednesday. It crossed land at 979 mb with winds gushing at 60 knts , that is 111 kmph. Now, it is moving fast inland and very gradually weakening. Located at 12.8N and 80 E. That is , it has moved due North inland, and is now proceeding towards Kanchipuram City. Centre is just about 45 kms SW of Chennai. Position as at 3 pm IST: Nilam centre now just 20 kms SE off Puducherry...almost about to strike land between Cuddalore and P'Cherry. At 979 mb, and 61 knts, clouds suddnely gaining height. CTT now -85c at centre. Tracked NW and is about 120 kms East of Karaikal and 250 kms SE of Chennai at 11N and 80.8E. Movement NW and core centre will hit land near Cuddalore. Maximum winds and damage areas shown in grades. Tracked very slightly W/NW since last vagaries' report of 0000 hrs. Now at 10.6N and 81.3E..having shifted just about 35 kms in that direction..pressure at 987 mb and peak winds increased to 65 knts now, and cloud top temperature at -82c. Interesting Cyclone history of Chennai provided by Pradeep on Inter Active Page of this blog..
Rajesh sir, is vagaries going to be featured in the TOI? Badlapur more chilled today morning with cirrus clouds also hovering in the sky. temperature is likely to rise again in and around mumbai ,also cloudy weather likely to prevail with light showers, from friday. AS-2 seems to be waking up from slumber. Badlapur is having cirrus cloud cover so sunshine is mild today. And temp is 31.5 C at 2.45pm. @ sset . As per satellite image its looking like Bangalore may get medium to heavy rain tonight ! Thanks for the update. Accurate description given. Its all chaos in Kea blog and my head started swirling. Btw sir, any good prospect of rain in bangalore. Its cloudy , drizzling and cold here. Can it get heavier this night. Now almost shadow in Badlapur as Sun hidden under thick cirrus clouds now. And temp is 30.3C @ 4.40pm. correct Vijay. SWM eluded Bangalore, NEM seems to follow same. Bangalore never received heavy rain, now it is just few drizzles - 10mm. Even TN much expected "extreme heavy" rains is not happening. Just 100mm of rain at 1-2 places. @ sset U can expect an increase in rainfall at night especially heavy falls....& also tommorow. All the other metro cities except Delhi getting rains or going to get rain in the coming days.But for Delhi-NCR,no chances of rain from any system.God knows when O-3 is going to reach india(still over afghanistan). Snaps of Cirrus clouds glare at the time of sunset on Vagaries FB group. As soon as sun is set temp fall to 26 C here in Badlapur @ 6pm. 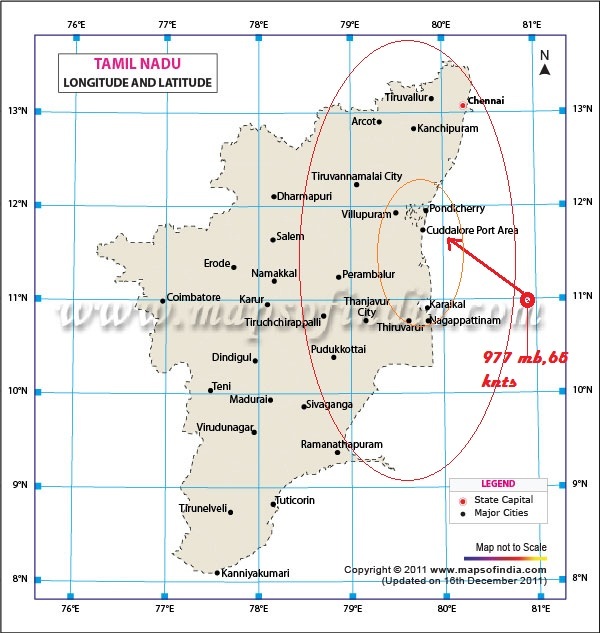 IMD declares Nilam made landfall over Mahabalipuram just south of Chennai & North of Pondicherry. Temp continues to drop rapidly today too. Badlapur having 23 C @ 7.30pm. @ sset. How's the Rain intensity in Bangalore at moment ? Badlapur temp 22 C @ 8.30pm. So getting chilly here. Rajesh, culd u explain the divergence reg the exact timing. You said 1830 hrs while sat maps were indicating the crossing by 1700 hrs. Is the difference basically start time and end times of the process ? @ emkay.In Badlapur its chilly from last 2 days. No need of fans even at night while sleeping. Badlapur temp 21 C @ 9.40pm and Karjat AWS also showing 20.9 C @ 8.30pm today. emkay: got the timings by minute visual observations and also from the regular updates collaborated by various agencies. The timing is manual calculation, on observations and agencies may differ by around 30 minutes also.And lanfall is seen and contemplated between 2 readings, of various intervals. Temperature falling down rapidly.Be prepared for tomorrow morning with a chilly cold & pleasant weather. @ Punnet. Yes getting chilly . Badlapur temp 20 C @ 10.30pm. Abhijit, Puneet , Thane not at all chilly or cold at the moment. Envirocon showing about 26° C same as yesterday. Maybe part of the island effect. @ GSB Thane min temp was 20.4 C today morning. Check IMD AWS for near accurate temp than envirocon AWS. Even Santacruz was 20 C today. And Badlapur was 16.5 C. Karjat 16 C.
Yes, GSB. TOI has interviewed me yesterday for my views on Nilam and general weather topics..and the popularity of vagaries..